Casey Harris — keyboardist for X Ambassadors — opens up about overcoming blindness to pursue his dreams. Plus, the rocker on his recent experience meeting fellow blind musician, the legendary Stevie Wonder. 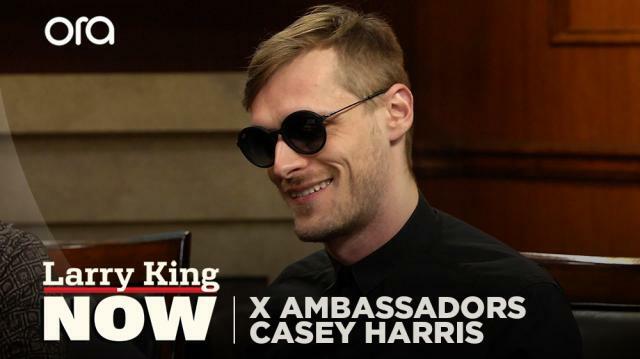 Larry King: Did being blind hold you back in any way, Casey? Casey Harris: Oh, no, no, not at all At least as far as fighting with my brother is concerned. No, I mean, I was lucky enough to grow up with really amazing community. I mean, growing up in Ithaca, New York. It's one of the most supportive, incredible, uplifting communities out there. And then, of course, we had our parents who got to give full credit to them, as well. They helped basically accommodate and make sure that life was accessible. Larry King: Are there other siblings? Casey Harris: It's just us. Larry King: Okay, do you look up to people like, Casey, you look up to people like Stevie Wonder or Ray Charles? Casey Harris: Absolutely. I actually just recently got to meet Stevie Wonder for the first time. Casey Harris: He was amazing. Larry King: So's Ray, Ray was a great guy. Casey Harris: God, if only I'd had the chance to meet him because they are both idols of mine. And, of course, they're both not only incredible blind musicians, but both changed the face of music. So the bar is set pretty high as far as being a blind musician, but it was such an honor to meet him and to get to talk to him. And he's such a down-to-earth guy and really just loves to have conversations. Larry King: Oh, and he's funny, too. Casey Harris: Oh, he's so funny and such a, just a humble down-to-earth fellow and I can't tell you how much I appreciate that.